100% Financing – you can buy a home with no money down. In some cases you can even finance your closing costs. They are just for farmers – USDA Loans are not “just for farmers,” millions of people from all walks of life already qualify. FHA or Conventional Loans are better – USDA Loans often offer better terms than an FHA or conventional loans. They aren’t flexible – Actually, USDA Home Loans can be used to buy a new home or refinance to a lower rate. Only certain people can qualify – Anyone who meets the income and credit guidelines can qualify for a USDA Home Loan. They are only for rural areas – Actually, USDA Loans are available in many areas that most people would not consider rural. For example, many small communities just outside of metropolitan areas qualify as rural areas according to the US Department of Agriculture. They are harder to get than FHA or Conventional Loans – This just isn’t true. 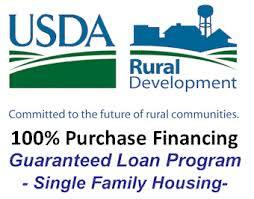 In many cases USDA Loans are actually easier to get because the loans are guaranteed by the government.